To anticipate the production increase from some new wells which recently drilled, some scenarios have been developed with regards to Gathering Center capacity. The current GC cannot accomodate some issues regarding the associated gas in production fluid. 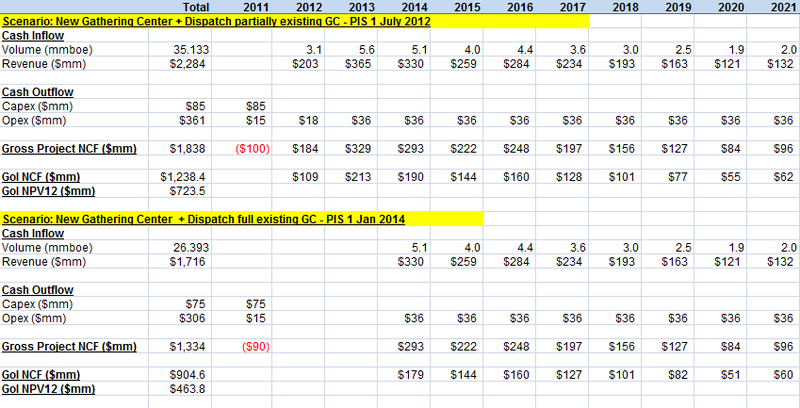 There are 4 scenarios to be evaluated in terms of Cash Flow Analysis to determine more benefit to the stake holders. The associated gas in Gathering Center is analyzed whether burned (additional Flare Stack Package) or own used (additional Fuel Gas Package). Life Time is predicted for 11 years. NPV calculated at 12% Discount. 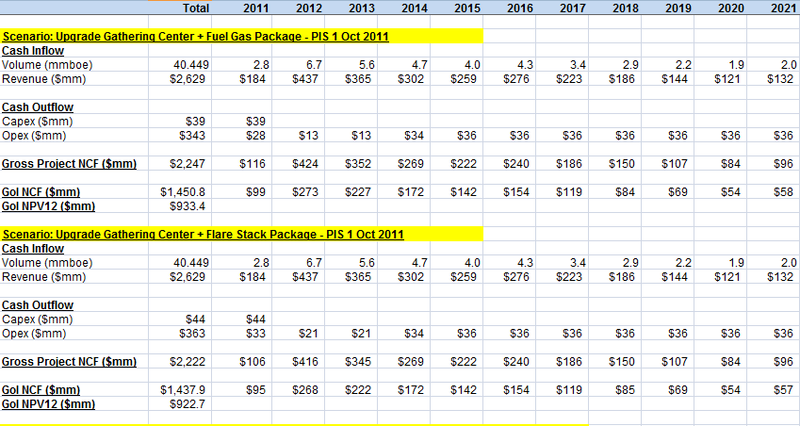 Scenario: Upgrade Gathering Center + Fuel Gas Package – Placed Into Service on 1 Oct 2011, is this worth Doing? Estimated revenue generated as calculated Net Cash Flow is US$ 1,450.8 million for 11 years operation. NPV @ 12% discount is equal to US$933.4 million. Const is mitigated under Risk Register. This entry was posted in Candra Nugraha, Group Member, Week #7. Bookmark the permalink. Absolutely AWESOME, Mas Candra!!! WOW!!! 1) I don’t see the investment costs included in the calculations? How much does the upgrade vs new plant cost? And why wasn’t the cost factored into the equation? 2) Where did the 12% come from? Is that the WACC or the MARR? For future postings, it might be interesting to show how or where that number was derived. Keep up the excellent work, Mas Candra! !